Wait: observe your surroundings; everywhere you look is a "postcard"
We finished up our visit in the south of Maine and made our way to our second destination of Searsport on the Penobscot Bay. The campground was a bit eclectic, kind of like a couple of hippies might have designed it. Lots of homemade signs, a "Fiber College" where they offered workshops in weaving, a stage for performances, a large game room filled with hanging artwork and multi-colored painted buildings. What a great welcome - A bluegrass concert! Pulling in to the entrance road, we noticed a stage filled with musicians just yards from the registration office. Fiddles, guitars, mandolins, banjos and a bass were jamming. What a great welcome! Actually, there was a bluegrass workshop booked in the camp for the weekend, so we quickly set up camp and then strolled back to the stage to sit and listen as they rehearsed. It turns out the musicians came from all over and a local university professor leads a regular workshop to discuss and play "Old-Time" music and Bluegrass. It was fascinating watching beginners and more advanced players working together to learn a song, then listening to the whole group play it together. Our site was the reason we chose this campground. It is right on the water, with sites lining the bay. Watching the tide roll in and go out, watching sunrises and sunsets made each day a bit more magical. Huge rocks and boulders covered with a yellow-green seaweed decorated the beach at low tide, and then acted as waving banners just beneath the water's surface when the tide came in. On the beach, at low tide, we saw a large labyrinth made from rocks just waiting for a reflective soul to walk its concentric path. The beach itself was not sand, but smooth, rounded rocks. A variety of colored ovals stacked and scattered like a 3-D carpet on the beach and the bottom of the bay. A labyrinth at low tide... what an interesting surprise! The bay is about 450 feet at its deepest point and hosts both commercial and pleasure boats. We watched sailboats in the distance and motorboats patroling the shallower waters for fish. The little campground beach was a perfect put-in point to kayak the bay and we took advantage to test our new solo kayaks. It was lovely. The sun and breeze were perfect and the water as still and calm as glass. The water clarity was amazing and we stared down to see the rocky bottom a good twenty yards offshore. We also enjoyed watching schools of small fish swim under the kayaks and even got a peek at a seal and a couple of otters in the distance. We had watched the seals from shore, and it was fun to get a little closer. Overhead, seabirds soared and dipped while calling to each other. Then, as we were watching, a bald eagle appeared from the shore and flew over us. I suppose the gulls alerted him that fishing was good! 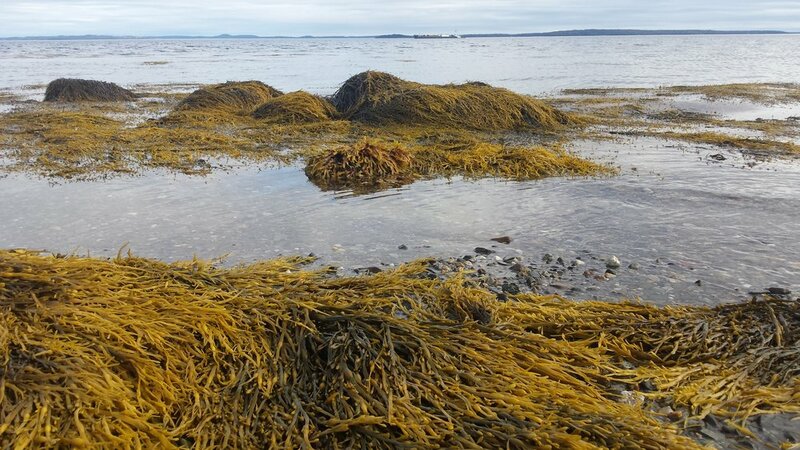 At low tide, the seaweed draped over the boulders, but at high tide, it stands up and dances in the current. 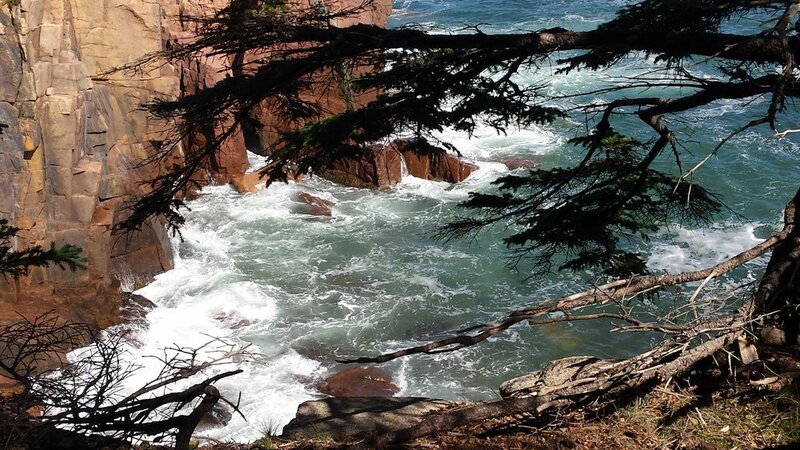 One of our main purposes for traveling north was to see Acadia National Park. We marked off a full day for the adventure and were not disappointed. We stopped by the National Park Visitor Center to get our bearings but it was so crowded that we went back to the RV to read the Acadia guide our friends in Atlantic Highlands had lent us. That was really helpful, and it wasn't long before we had a plan for seeing the park. We decided to use the island shuttle bus to get around in the park since parking is at a premium. It was a good decision. The shuttle stops at most of the points of interest and the trail heads. We chose the Ocean Trail for our first hike since it follows the water. We began at the sand beach. From the road, we could hear the waves crashing against the cliffs and as we descended the stairs from the roadway to the beach, the rush of salt air and sound drew us downward. 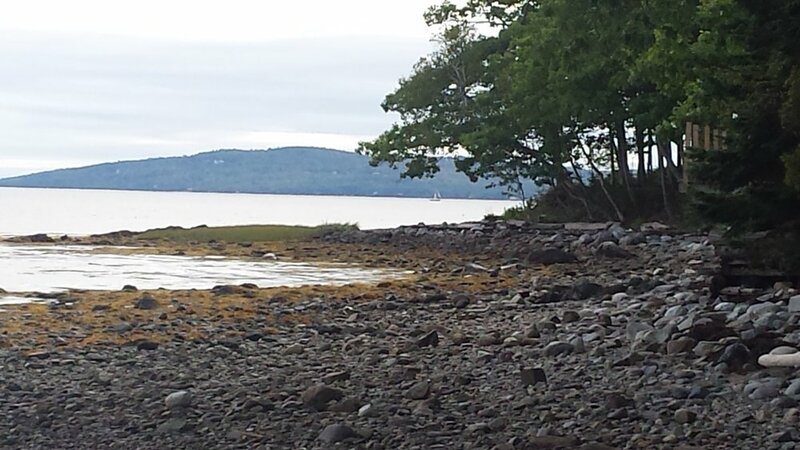 The sandy beach is an unusual site in this part of Maine. It stretched for about 300 yards in a curve and was capped on either end with rocky cliffs. Surf was high and rough, so the sound was thunderous. Looking up the cliffs to the pine trees hugging the ledges, hearing the sound of the surf and smelling the salt air was intoxicating. We stood there for quite a long time just taking it all in. Beach Nana at a new kind of beach! Climbing back up the beach staircase we followed the signs to the trailhead for the Ocean Trail. It follows about a two-mile stretch along the cliffs overlooking the Atlantic. There are little side paths that take you from the main trail to the very edge of the cliff, onto huge boulders. Standing there at the edge, with that same salt air and sound of surf assaulting us was magnetic. I think we followed three or four side trails just to see the different angles of the cliffs. Our destination was Thunder Hole, which is really only thunderous about two hours prior to low tide. Our timing was off, but it was still impressive as the high tide surf pounded over the closed walkways. A tip is to not walk all the way to the Thunder Hole viewing area. Instead, there is another path about ten yards down the trail that offers spectacular views without all the crowds. People just stand there on the boulders, watching, listening. It is quite mesmerizing. After our hike, we hopped back on the island shuttle and made the full loop around the park. A second trip will be necessary to experience all the park has to offer, but we were quite impressed at what we took in on our visit. The drive back to camp took us through a dozen coastal towns and lovely wooded byways with peek-a-boo views of the Atlantic. It is hard to describe the beauty of the Maine coast. Photos do not do the scenery justice and words cannot adequately describe the sounds of waves crashing against rocky cliffs, the strong smell of salt air that hangs over the coastal trails or the sight of the Atlantic sparkling in the sun and rolling up to the rocky cliffs covered in pine trees. Back at camp, we opted for a glass of wine to celebrate sunset and take a dinner from our freezer stash. 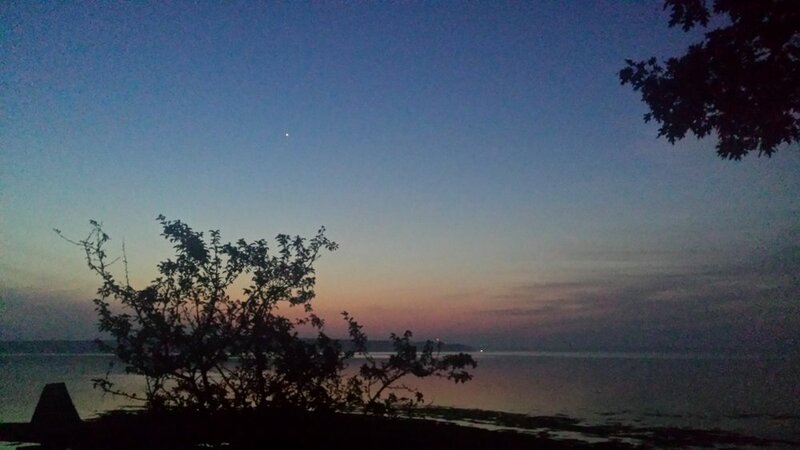 Having spent the day driving and hiking, we were ready to simply enjoy a Maine evening watching the sun go down over the water and the stars make their nightly debut overhead. Tomorrow's agenda would include a walking tour of nearby Belfast, and we were curious about what we might find there. Breakfast on an "exploring day" is typically eaten at a local restaurant. It helps immerse us in the local vibe. We opted for a quick bite at "Bell the Cat". It is a kind of a coffee shop/sandwich spot, offering several excellent coffees with a host of interesting breakfast sandwiches. As we were leaving we saw a car pull in with license tags from our home Georgia county! We asked where he was from and, lo and behold, he lived not far from our neighborhood. He was staying at his summer place in Maine while his new home in Georgia was being completed. It was just one more reminder how small the world really is! Belfast was a surprise. We had heard about Portland, Rockland, and Camden but no one ever mentioned Belfast. It is a beautiful town just south of Searsport. One of the first things we noticed as we walked around, was the absence of the ubiquitous t-shirt shop vibe. Instead, the town center offers boutique shops, regular businesses, and good local restaurants. We passed by a shoe store that has been in operation since the 1800's! The manager was sweeping the doormat as we walked by. It was quite early and the town was quiet so we stopped to look in the shop windows, take photos and just stroll the empty streets. The harbor sported a fleet of sailboats at anchor as well as fishing boats at the wharf. We had parked at the edge of downtown near the harbor and enjoyed strolling through the grassy park along the margin of the bay before heading back to the RV for a driving tour of the area. As we drove around the neighborhoods surrounding the town center, we saw many newer homes as well as old homes, including some with historic name plaques. The outer reaches of town had that same coastal feel with older churches, clapboard houses, and neatly maintained parks. We imagined what the area would look like blanketed in winter snow; almost like a storybook! On our drive in from Acadia, we had seen a sign for Sears Island. Sears Island is one of the largest undeveloped islands on the east coast hosting wildlife and coastal forests fairly untouched since the original Native Americans lived there. So, leaving Belfast behind, we headed out to look for the causeway that would take us over to the uninhabited island. After a few misses, we finally found the entrance but the causeway and island are closed to vehicle traffic. Instead, the island offers hikers multiple trails to enjoy. 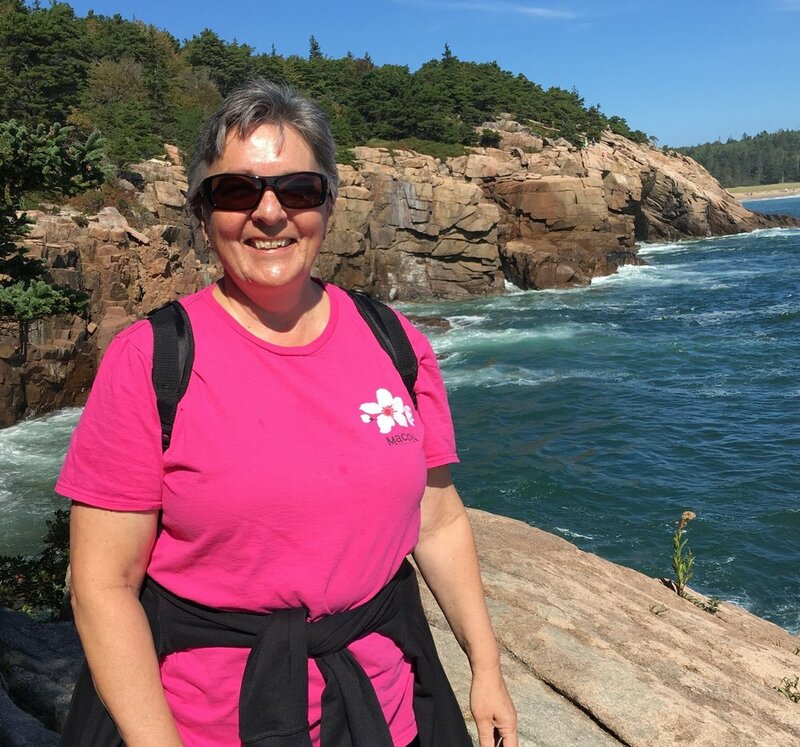 Wildflowers, sandy and rocky beaches, as well as tidal pools and coastal forest make the 5-mile hike around the island a visual pleasure. It was our last day in Maine and, in the morning, we would begin our return trip through New Hampshire, Vermont, New York, and Pennsylvania and south through Virginia, North and South Carolina. We had a few stops to see family and friends along the way and we were excited to share what we had experienced. The last afternoon in camp after a long stay like this is spent preparing. We took inventory of the groceries and created menus and shopping lists for the trip home, we cleaned the unit inside and checked all the essentials on the outside to make sure we were road-ready. We enjoyed our last evening under the stars listening to the tide roll in and playing the uke and guitar. Good night, Maine. View our Photo gallery for this trip! Want to know more about the inflatable kayaks we used on Penobscot Bay? Check out our Gear page to find all our favorite travel stuff!